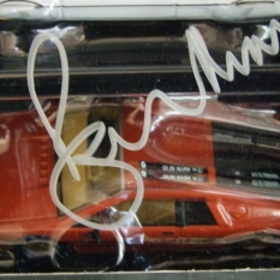 Sir Roger Moore has signed a limited edition set of model 007 cars for a new charity auction. The set consists of 2 Corgi Roger Moore-era Lotus cars, from the iconic 007 James Bond series. Proceeds from the auction will benefit the Prince's Trust. 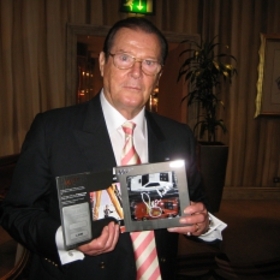 The box in which they come has been personally signed by Roger Moore, and shows the edition number 1441 of 1500. This particular set was 1 of only 100 of these signed by Sir Roger worldwide. 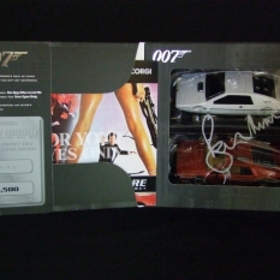 It is the signed edition number ‘007’ which of course makes this one that more sort after and collectible. 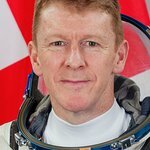 The toy cars are being auctioned by Sellebrity.org.uk, a new way to help charities help others through online auctions of celebrity donated items. Everyone’s a winner with Sellebrity. 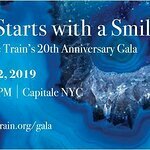 Celebrities have another way to use their public profile to help good causes, and fans, and collectors are able to buy things that have a very special provenance. The auction runs until August 28, and can be accessed here.